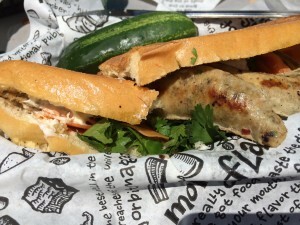 Tell anyone who has been there that you are visiting Ann Arbor, Michigan and they are likely to mention Zingerman’s. Passionately, lovingly, enviably. It is an Ann Arbor institution for good reason. 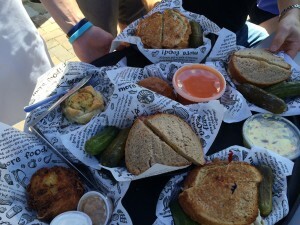 Most people are referring to Zingerman’s Deli, which attracts long lines for its Jewish-style sandwiches, knishes, breads, and selection of artisanal delicacies. 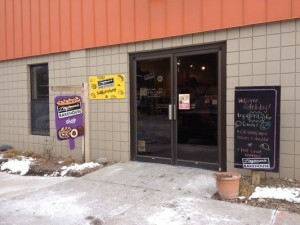 But Zingerman’s is actually a community of eight businesses. 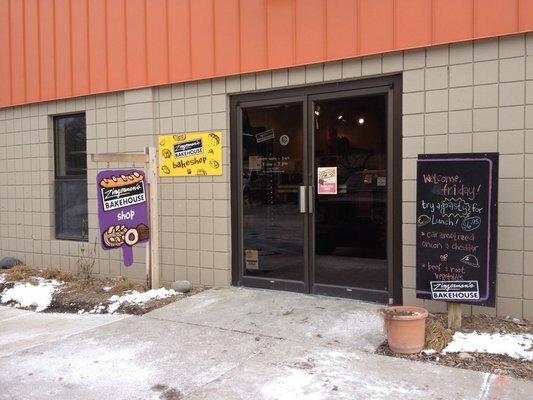 These include the Roadhouse and a “compound” featuring a bakehouse, creamery, and coffee shop. We are in Ann Arbor for the momentous occasion of my son’s wedding. (Will saying this ever be anything but surreal?) Dozens of our loved ones from all across the country are coming together to celebrate. And they all want to go to Zingerman’s. The day before the wedding we precede the obligatory manicure/pedicure with a trip to the Zingerman’s compound for breakfast. 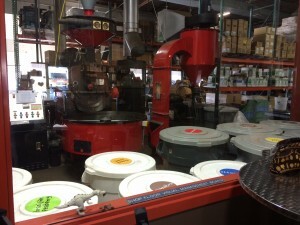 We begin at Zingerman’s Bakehouse. There’s a nod to Jewish tradition with bagels, mandelbread, rugelach, and beautiful challahs. Cinnamon rolls, lemon scones, eclairs, and cheese danish are also begging to be sampled. It may be a pre-wedding hallucination, but these pastries all seem to be chanting “pick me, pick me!” So we select an assortment, and move on to Zingerman’s Creamery. Here we take in the spectacular sights of house-made cheeses and gelato. We are treated to samples, before ultimately selecting goat cheese spread and honey gelato to accompany our breakfast pastries. 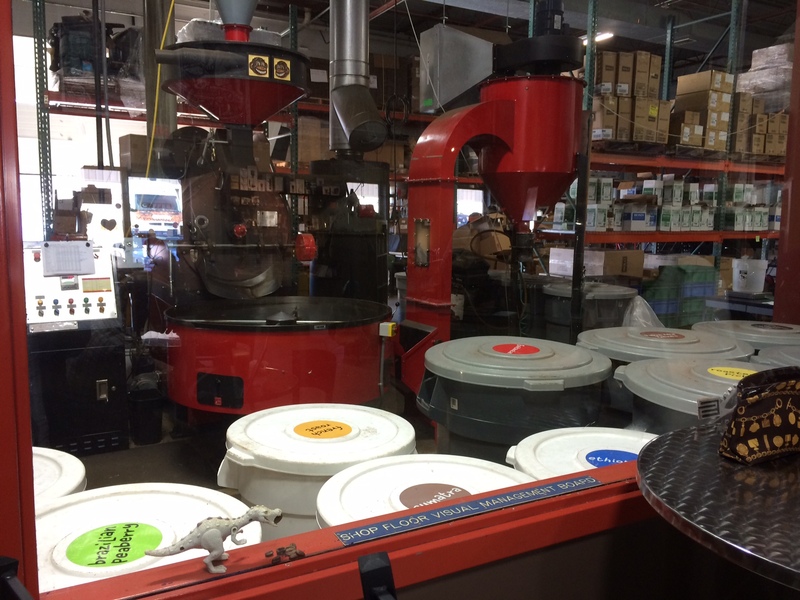 Our final stop is for lattes at Zingerman’s Coffee Bar, where the beans are roasted on the premises. Here we can indulge in all of the goodies we have collected along the way. A mani/pedi later, it’s time for lunch. We join a group of my son’s friends at Zingerman’s Deli. Dining here is a somewhat chaotic process, which involves lines snaking through the restaurant. It requires patience and perseverance. There are those who forgo the experience, choosing instead to sate their hunger in a more rapid fashion. I have never been able to truly relate to people who subscribe to this school of thought. 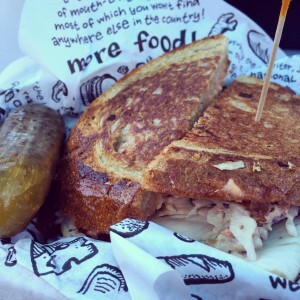 Zingerman’s Deli is revered based on the strength of its sandwiches. Simplicity reigns supreme. This is about quality meats, bread that is crusty on the outside and springy on the inside, and crisp flavorful pickles. It’s not the best place for the indecisive, as the options are numerous. I am tempted by the best-selling Reuben, but instead opt for the new-to-the-menu Banh Mo. 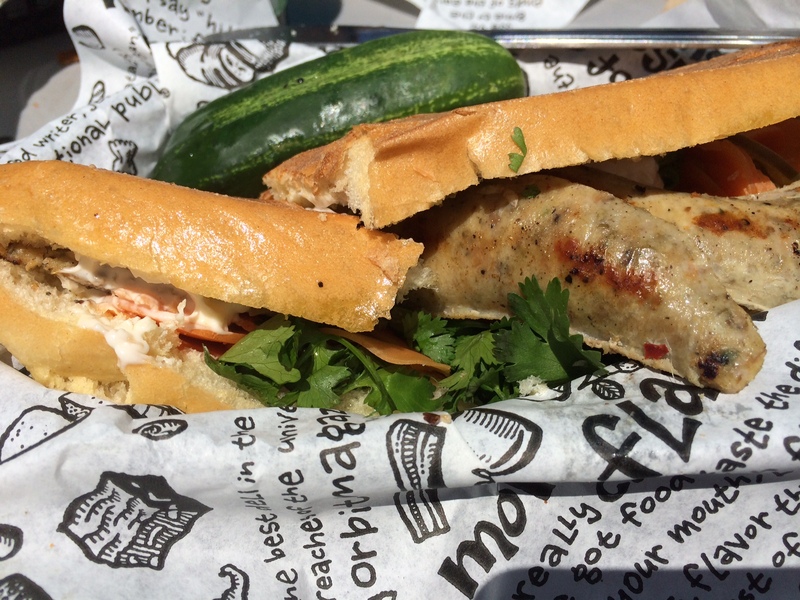 The delectable sandwich features locally sourced Vietnamese chicken sausage, pickled carrots, and fresh cilantro. Our enthusiastic group indulges in an array of sandwiches, crispy latkes, knishes, and more. We are unanimous in our praise for the food. The legend that is Zingerman’s Deli lives up to expectations. As I later describe my Zingerman’s meals to friends and family, their faces light up. I realize that my chances of exploring other restaurants in Ann Arbor will have to wait for a future visit. I repeat the entire process for breakfast and lunch the next day. I order the Georgia Reuben with turkey, Swiss cheese, coleslaw & Russian dressing on grilled rye bread. It’s just a sandwich, but it has an extra special zing to it. I delight in the Zingerman’s experience with more than 25 of our wedding guests over a two day period. Zingerman’s is indeed an institution. There’s no better place to spend part of this most memorable weekend, where we celebrate another great institution…. marriage. Zingerman’s Delicatessen, 422 Detroit Street, Ann Arbor, Mich.
Zingerman’s Bakehouse, Creamery, and Coffee Bar, 3711-3723 Plaza Drive, Ann Arbor, Mich.